i usually don't write out recipes, but this time i was spurred on by an email from fennie asking for recipes. for this dessert, i just about never measure, so writing out something more formalized so someone else could follow was pretty amusing to me. all you really need is the ingredients and "method" (if i can even call it that), and then you get an extremely tasty but equally simple dessert to satisfy on a summer evening. 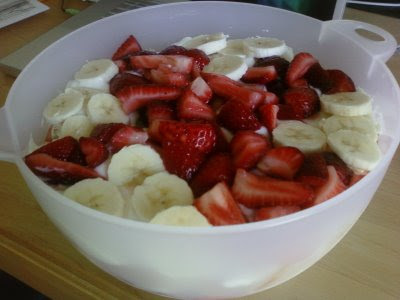 3) cube the angel food cake and cut the bananas into thin slices, place aside. 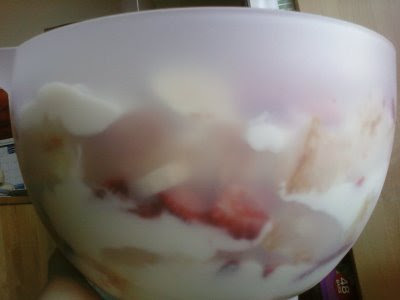 any container works, like this mixing bowl. 6) serve with a large spoon, making sure to scoop several layers at a time. this recipe can really easily be modified for anything you have in the fridge. i've used blueberries instead of the strawberries and bananas, and also substituted the angel food cake with ladyfingers. you just need to have a certain consistency in sweetness for the fruit. et...voila! easy, but light and tasty. and fast - the turnaround will be lightning quick.